I used to hate binding quilts! I had a stack of quilts bigger than I will admit just sitting in the corner awaiting that one final step. Then one day I decided I needed to bite the bullet and get them done. 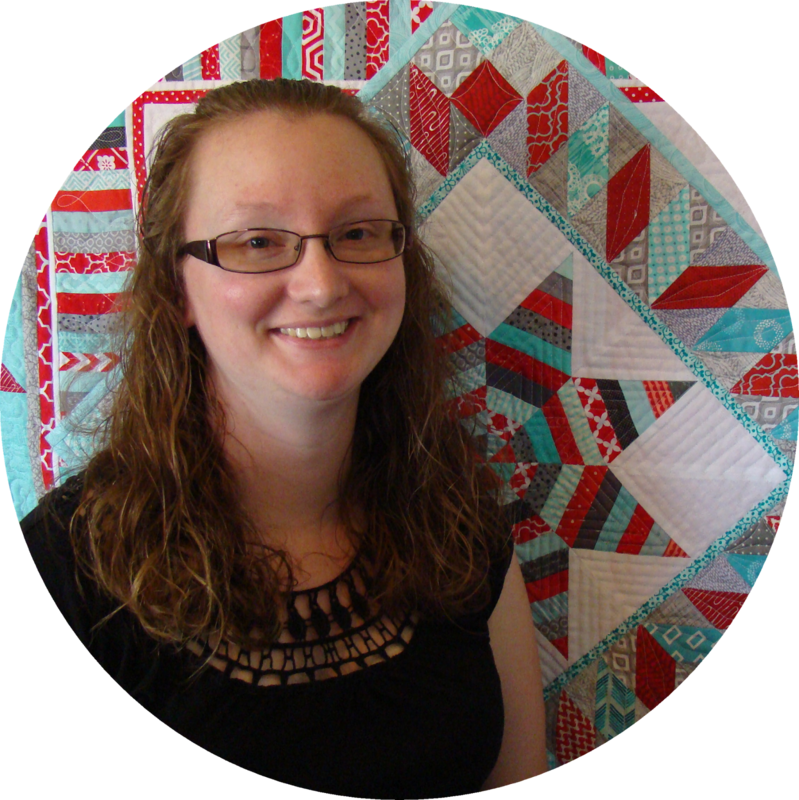 Since that day, I've made over 50 quilts! I have figured out a binding method that works for me and now I enjoy it just as much as the rest of the quilt-making process! I know there are already a lot of tutorials out there for how to bind a quilt by machine, but if you're like me, none of them seemed to work just quite right. Please use what works best for you! 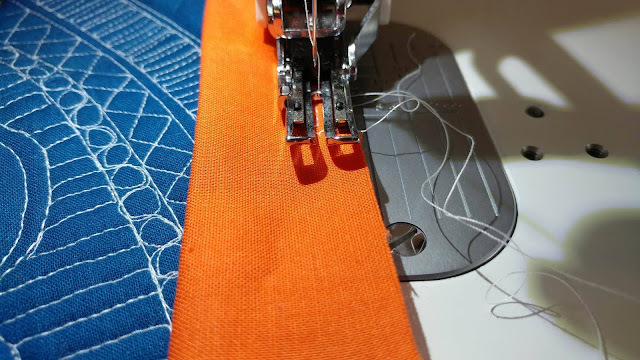 Most of the choices I make when binding a quilt are to make the process as quick, easy, and painless as possible. 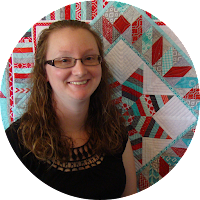 I hope this tutorial helps you find joy in the final step in the quilt-making process too! Sew strip ends together. 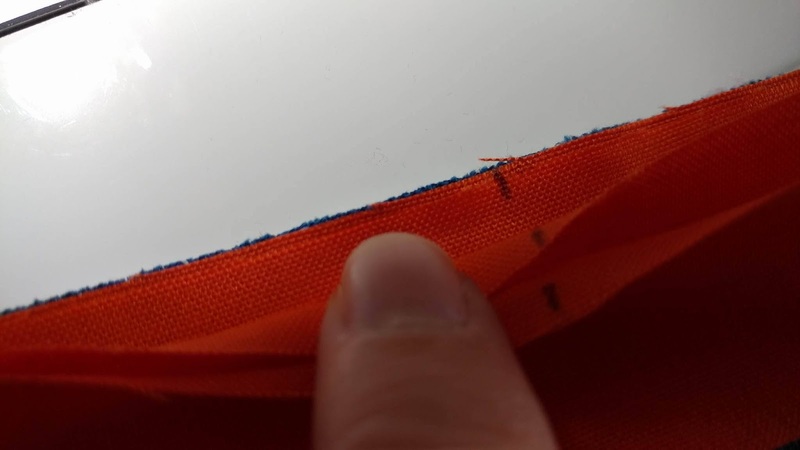 Lay strips right sides together and stitch 1/4" from the end. Align the raw edge of the binding with the raw edge of the front of the quilt. Begin at a spot in the middle of one side of the quilt. Begin sewing about 10" from the binding end (leave it loose like a tail). 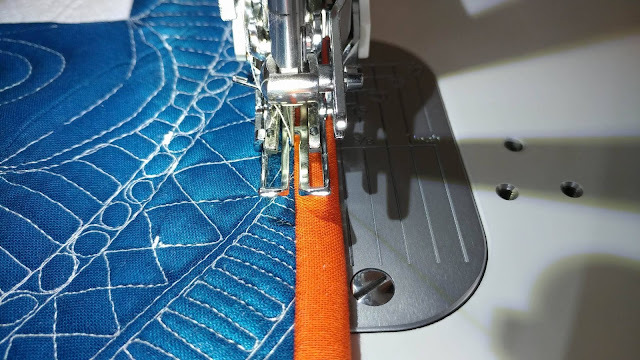 Use a walking foot to stitch 1/4" from the edge of the quilt. 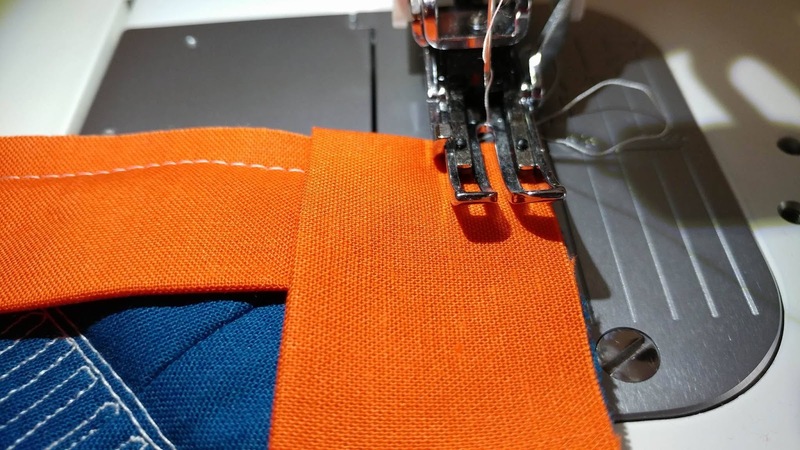 When approaching a corner, stop stitching 1/4" away from the next side. Lift the needle and presser foot. Pull the quilt away from the needle. Turn the quilt so the side just stitched is across the top and the edge needing binding is along the right. 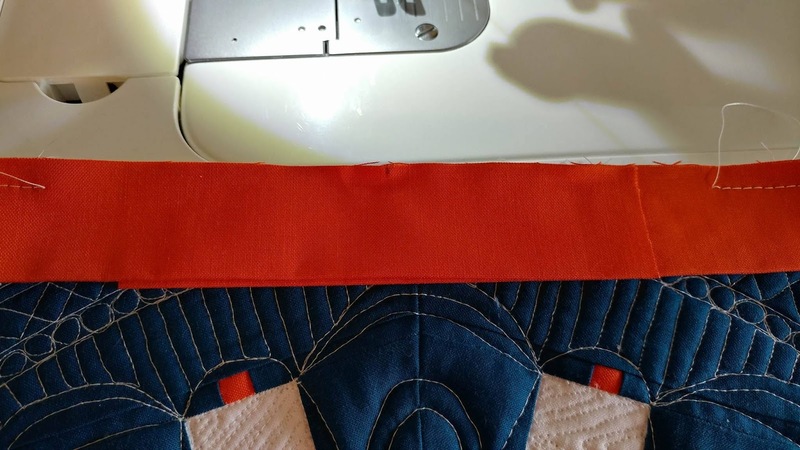 Fold the binding strip up, away from the quilt, so that the raw edge is even with the raw edge of the quilt. This will create a 45 degree angle in the binding on the corner. Finger press the 45 degree fold, making sure the fold lines up with the corner of the quilt. 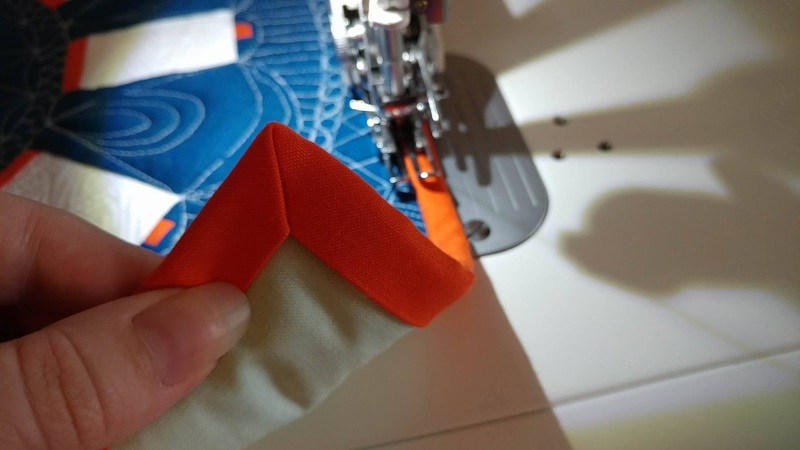 This step is what ensures a nice, crisp corner on the front of your quilt. Fold the binding strip back down, aligning the raw edges of the binding and quilt. Be sure to fold the fabric right at the top edge of the quilt. Finger press. Begin stitching again. This time, right at the edge of the quilt. Continue around all sides of the quilt, repeating the steps above for each corner. On the final side, stop stitching about 10"-12" from where you started. Pull the quilt away from the machine and trim the threads. Lay the quilt on a flat surface. Lay one end of the loose binding down along the unsewn section. 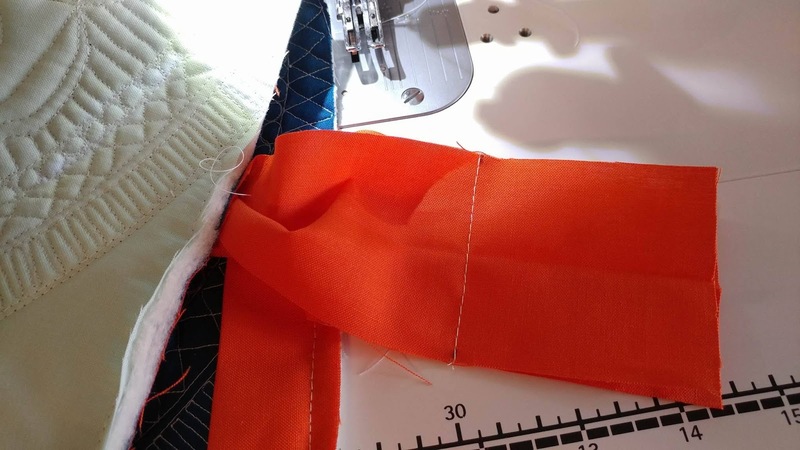 Trim slightly if needed in order to be just short of where the stitched section begins. Lay the other end of the loose binding on top. Trim to be just shy of where the stitching begins. Eyeball the middle between the ends of the stitching. 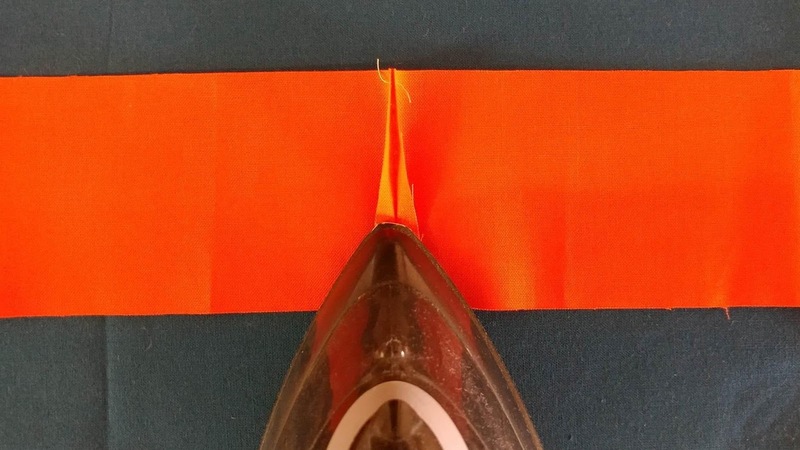 Using a marking tool (I use what I have laying near me - washable marker, pencil, pen, white quilt marking pencil if using a dark binding), place a small 1/8" line perpendicular to the raw edge. Mark the exact same spot on every layer of binding, on both the right and wrong sides. I just barely lift the edge with my finger to mark the lines. You should make a total of 8 marks. 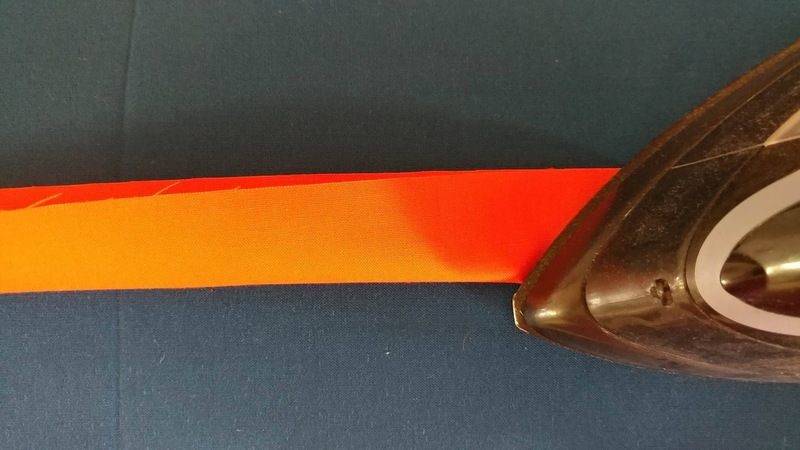 Open the ends of the binding. 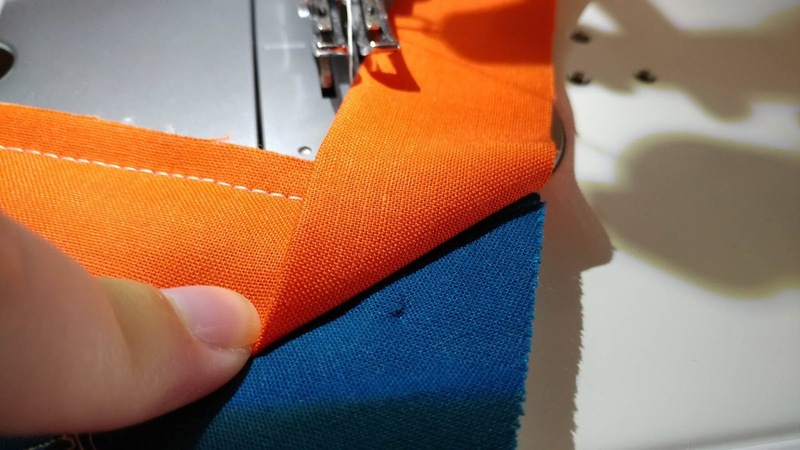 Place the two ends of the binding strips right sides together, matching up the marks you just made. Fold the main part of the quilt to get enough slack in the binding. 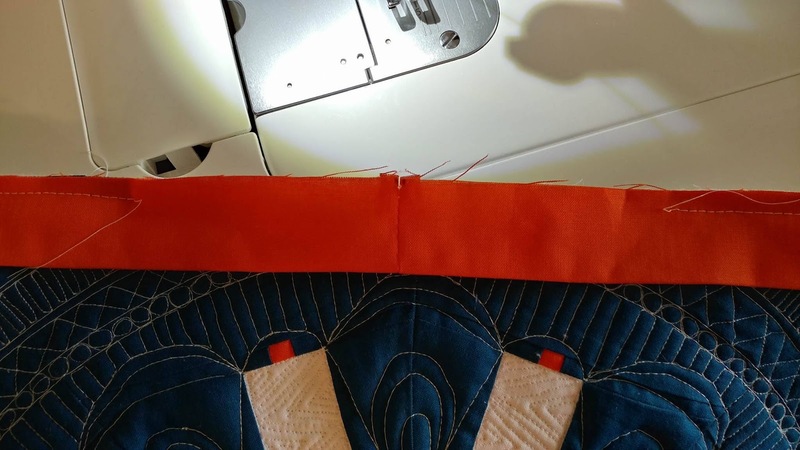 Pull the binding away from the quilt and line up with your needle. 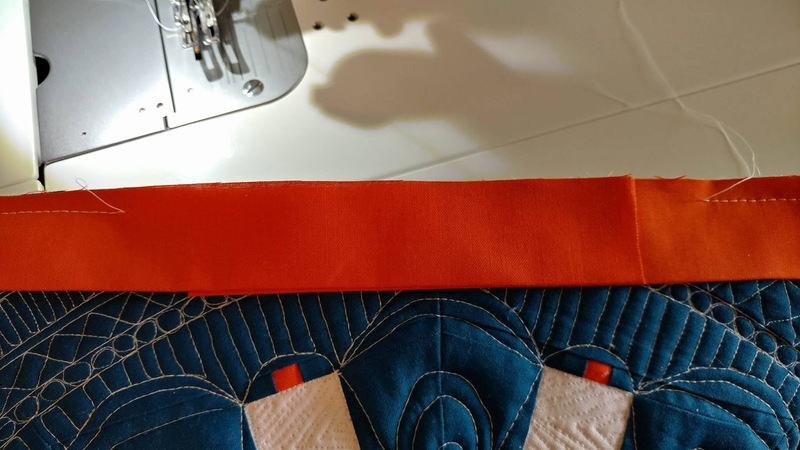 Pull the quilt edge straight again to check to see if the binding is the right length. If not, take out the seam and try again. If you are happy with the way the binding finishes, trim the excess fabric in the seam allowance. Cut the fabric 1/4" away from the stitches. Refold the binding strip and align the raw edges with the edge of the quilt. Finish stitching the binding to the quilt. Stitch at least 1/4" on top of the stitches where you stopped before, then stitch at least 1/4" beyond where you first started stitching. 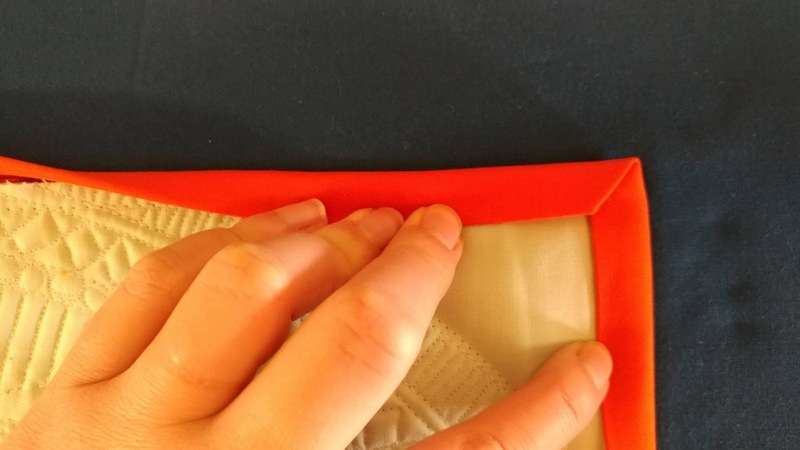 This helps to secure the stitching from coming out. Alternatively, you could backstitch to lock the stitching. The binding should now be stitched all the way around the quilt. 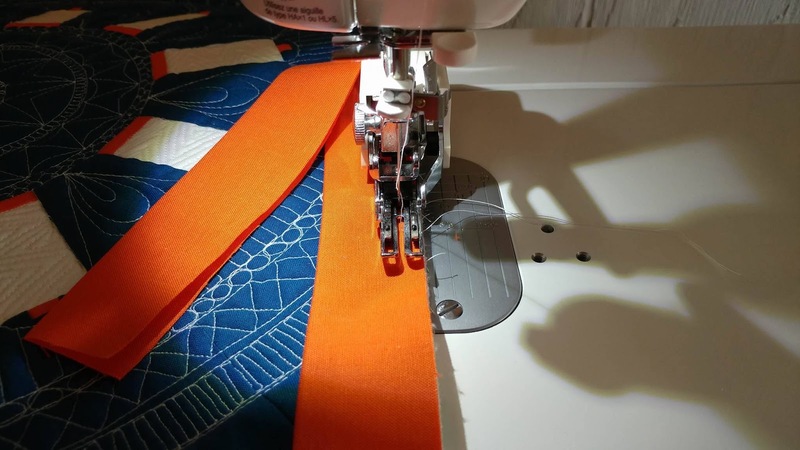 The next few steps are what really helps me be successful when machine binding! 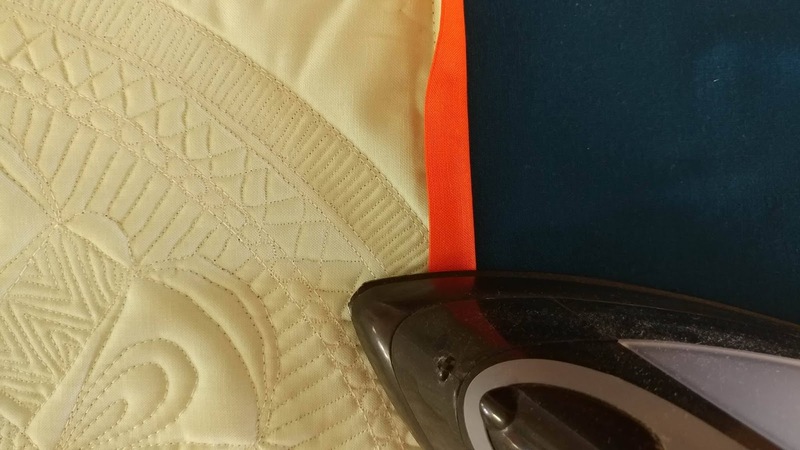 Using a hot iron with no steam, press the binding from the front. 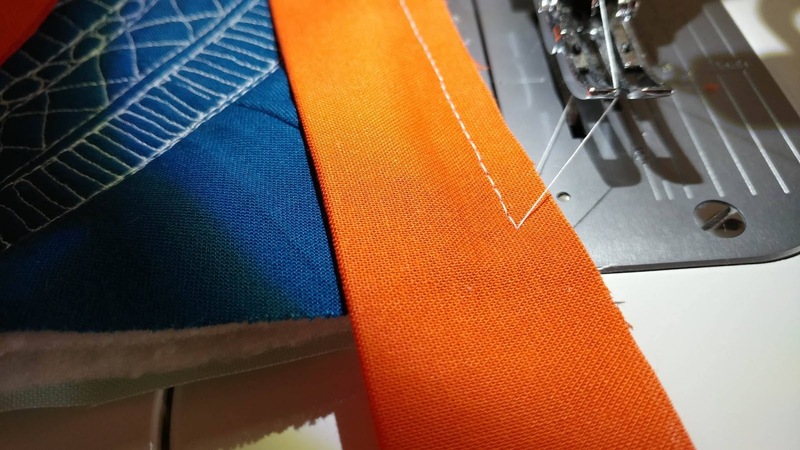 Pull the binding taut to cover the stitching line. NOTE: If you use polyester batting, the heat of the iron can melt the batting. 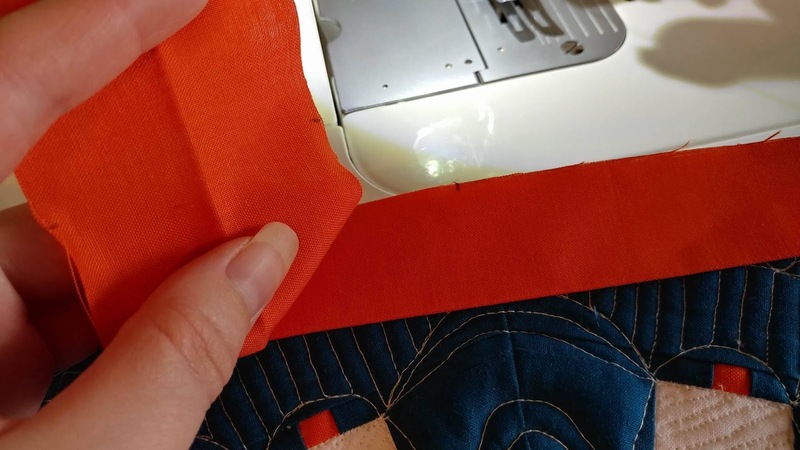 Use low heat, iron quickly, and just press the binding edge, keeping the iron off the main part of the quilt. Continue pressing the binding all the way around the quilt. Flip the quilt over to the back. I am right handed, so I start on the right side and work up and to the left. Pull the binding taut, then fold it over to cover the stitches on the back. Press. (Remember just to press the binding if using polyester batting.) Be sure to press the binding evenly. 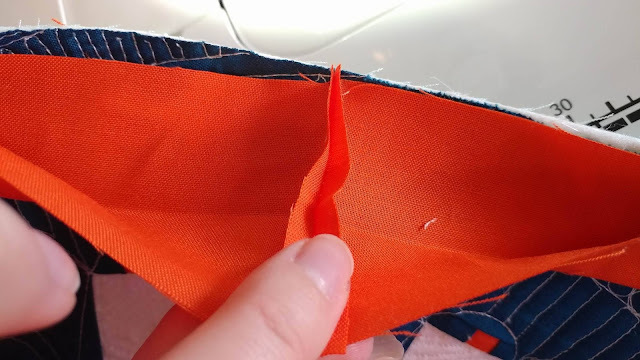 When you get to a corner, continue pressing the binding straight off the edge. This will create a 45 degree angle in the corner of the binding. Fold the binding over on the top edge, keeping it taut, and leaving the 45 degree angle in the corner. Use your fingers to line up the edges to create a crisp corner. Press. Continue pressing around the entire quilt, repeating the steps above for each corner. Flip the quilt back over to the front. 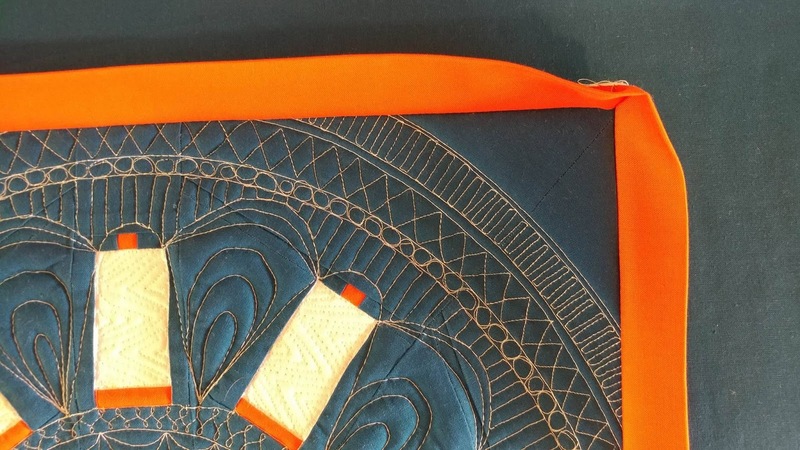 The pressing gave the binding some "memory" to know where it should go. Now it just needs gentle adjustments as you stitch. Start in the middle of one side. 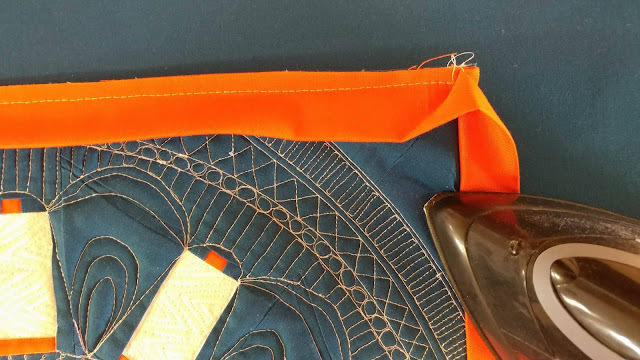 Be sure the binding is taut and covering the stitches on the back. Then place under your needle. 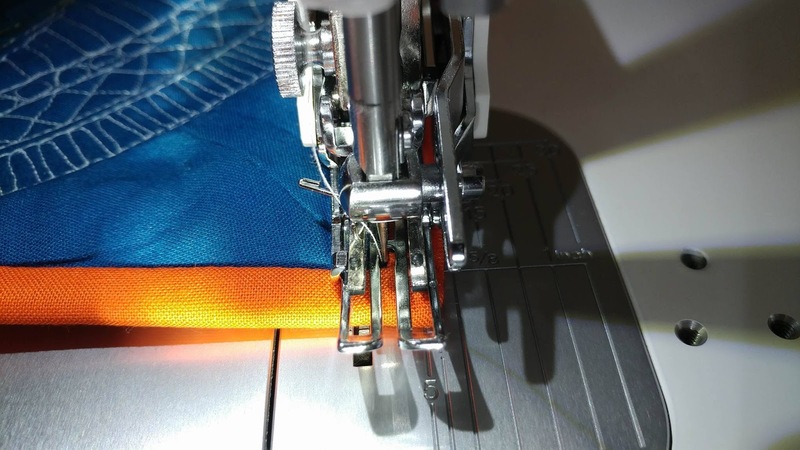 Use a walking foot, and stitch in the ditch (the edge right between the quilt top and the binding) from the front. Be sure the needle is exactly in the ditch. Go slowly so each stitch is right in the ditch. It's called a walking foot for a reason! 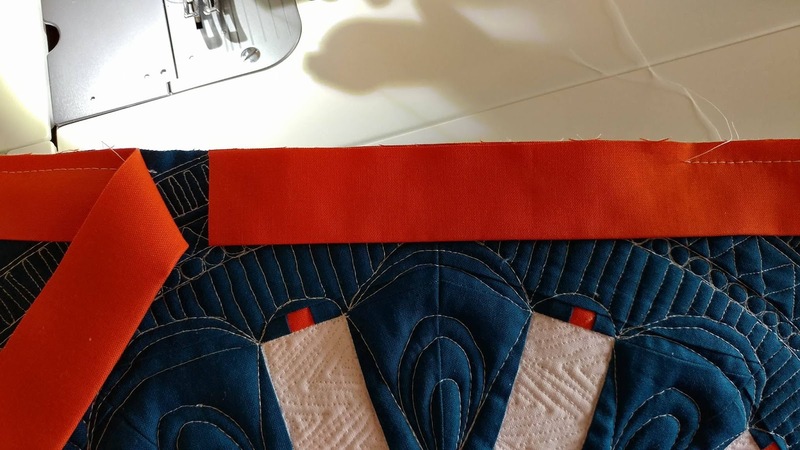 As you stitch, every few inches, lift the quilt and be sure the binding is pulled taut and covering the stich line on the back. 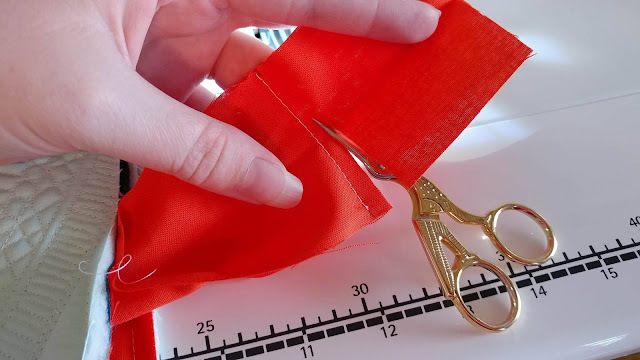 I like to pull it taut with my right hand, then lay it down on my sewing machine table and put light pressure on the binding with my left hand. When you near a corner, lift the quilt and be sure the corner is lined up just like you want it. Place it back down, holding in place with light pressure from your left hand. Continue stitching right to the corner. End with the needle down. 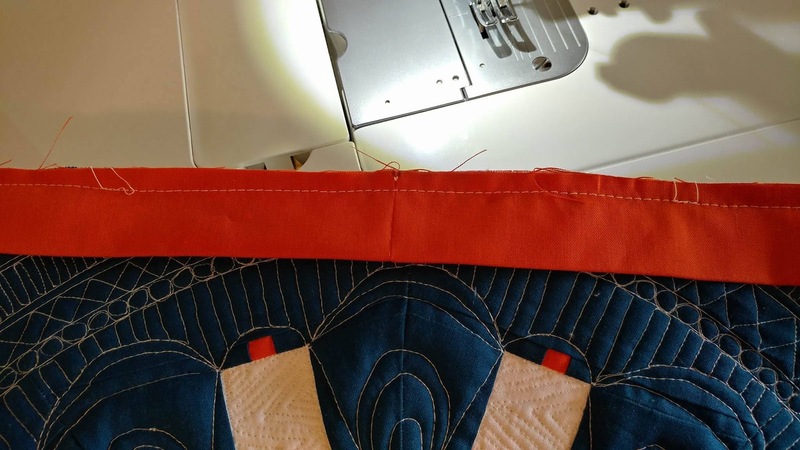 With the needle down, lift the presser foot and rotate the quilt. 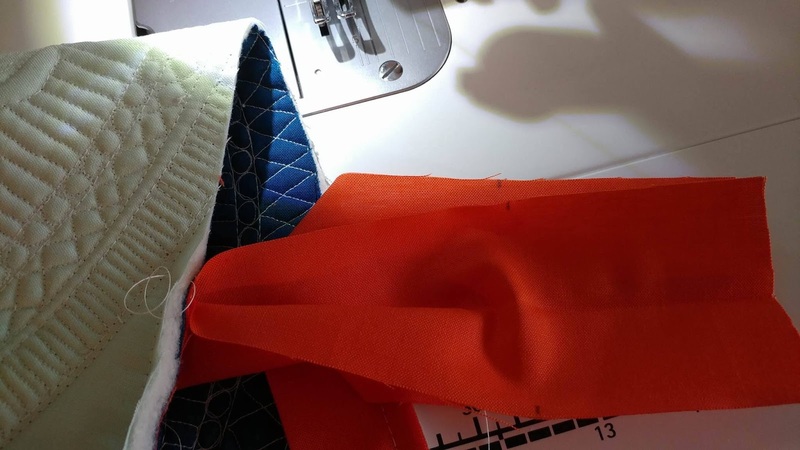 Put the presser foot back down and begin stitching again. Continue stitching all the way around the quilt. When you get back to where you started, backstitch a couple stitches to secure the stitches. You're done! Flip it over and be sure the stitches caught the binding all the way around. If there are any sections that didn't catch, you can go back and pull the binding a little more taut and stitch it again and/or stitch closer to the binding in the ditch. Pat yourself on the back! You did it! 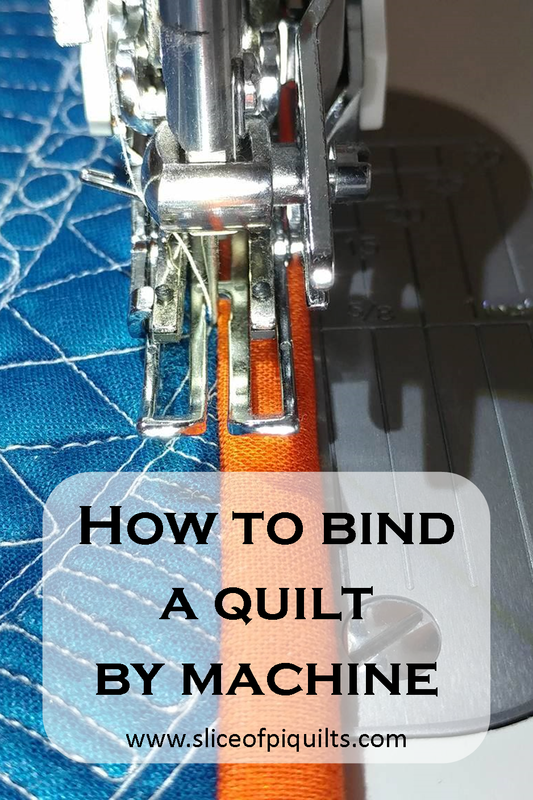 Linking up to Tips and Tutorials Tuesday at Quilting Jetgirl. This is a beautifully explained and photographed tutorial! 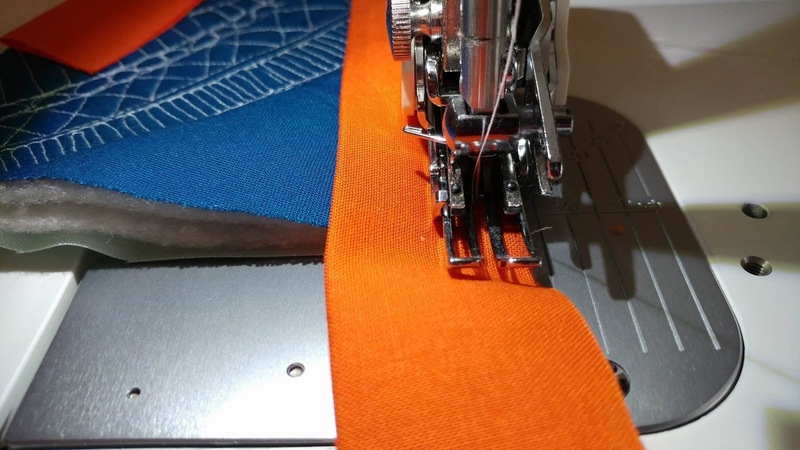 Have you tried going down to a 2-1/4" wide binding strip? You might have enough practice with your method for it to make a crisp finish on the back. I also really like your low pressure method for joining the tails of the binding. Thank you for sharing and linking up! Easy-to-follow tutorial with some great photos! Your finished binding looks perfect. Your machine binding is perfect! Thanks for the tips! Would not pass for competitions but great for practical quilts, thank you!! I hate the hand stitching with a vengeance, that is why I got a pile of quilts waiting, hahaha! what way would pass for for competitions? 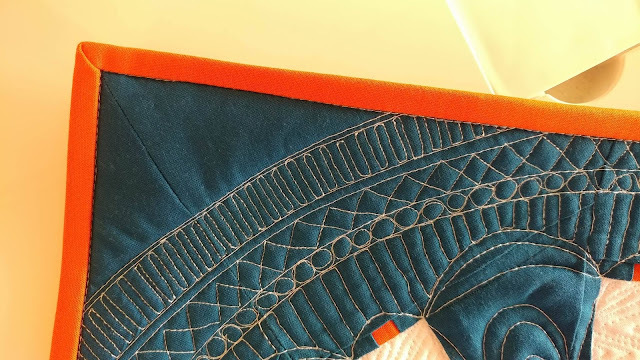 Quilt competitions often require hand stitched binding on the back, including in the corner mitered folds. Some even require the stitching in the corner mitered folds on the front too! 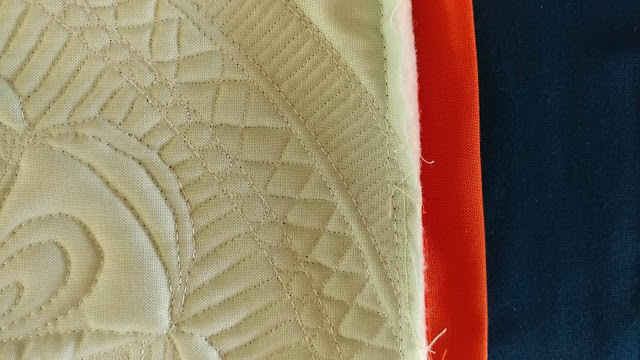 It looks like you stitch the binding to the front of the quilt and turn it to the back. Is this correct? 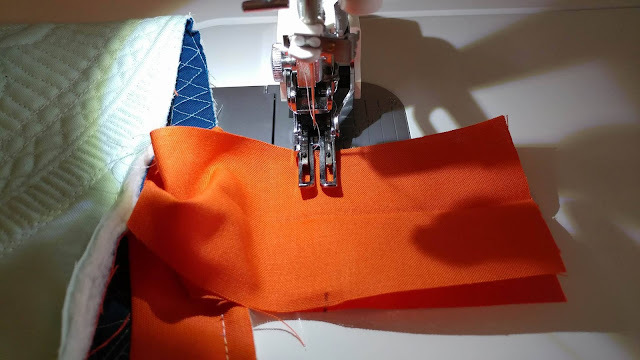 I don't mind doing the binding but mine is not great so this is a wonderful tutorial. I also dislike sewing binding on the angle. :) So I'm glad to see how to do it straight. I struggled to find a video that shows it. I've done one quilt this way and it's not appreciably thicker at the seams. Your way is much simpler. Thanks! Yes, I stitch to the front and then turn it to the back. 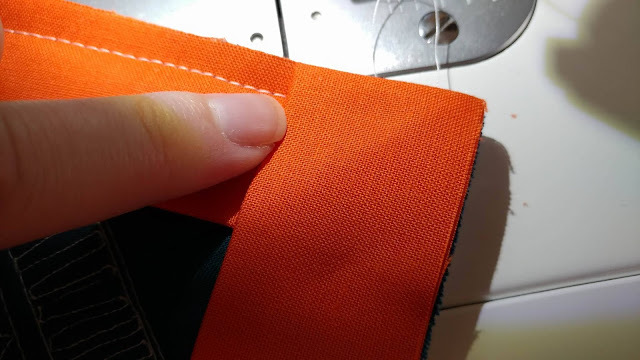 If you press the seams open, there is very little bulk at the seams. Just use a small stitch length so the stitches don't show. Glad it was helpful! Great tutorial! This is how I've been binding my quilts, since I utterly refuse to hand stitch. 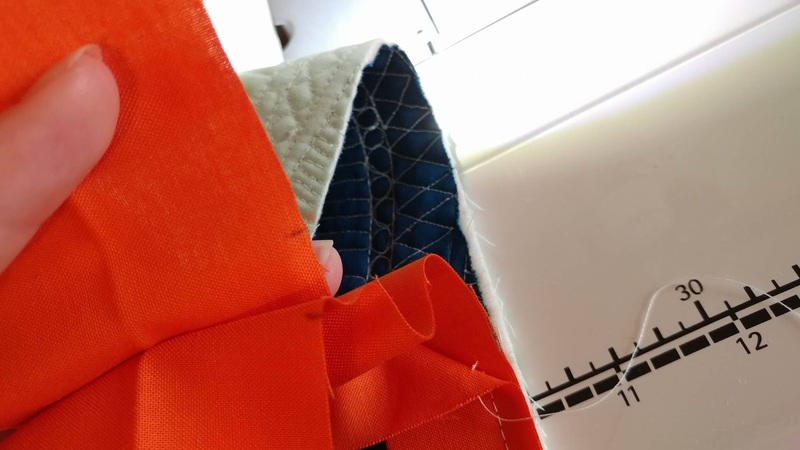 A lady at Quiltessential Co. in St. Albert, Alberta, Canada, gave me a great tip when I was complaining about how badly I miss catching the binding when I sew through from the front (and how horribly uneven the front of the quilt ends up looking if I sew from the back instead). 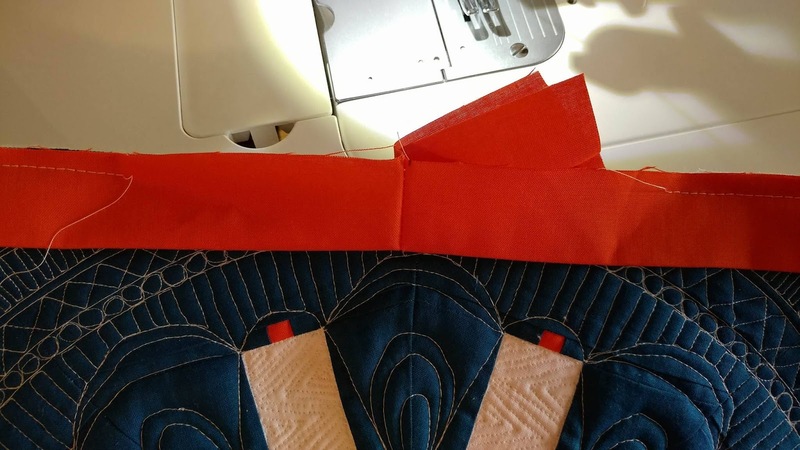 She suggested using this exact method, but attaching the binding to the BACK of the quilt instead, and folding it to the FRONT of the quilt. 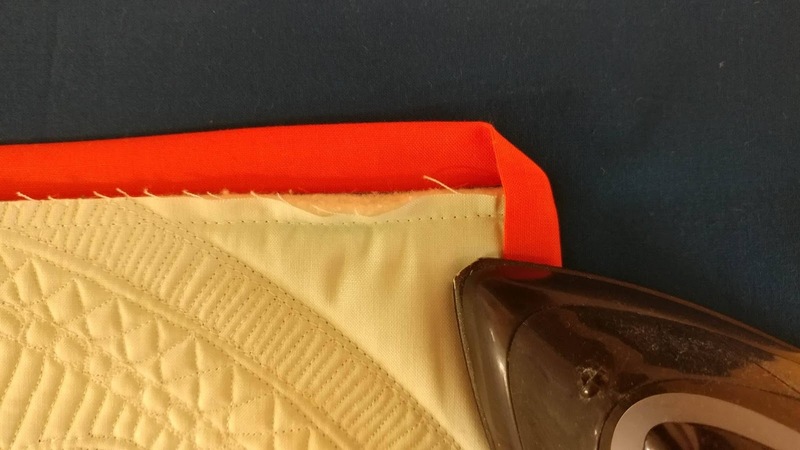 That way, when you stitch the binding down from the front (very close to the edge of the binding strip), you can see exactly where you are in relation to the raw edge, so you won't miss any spots and the front will end up looking way better. I haven't tried this yet but I'm going to - can't wait! I like this idea a lot! 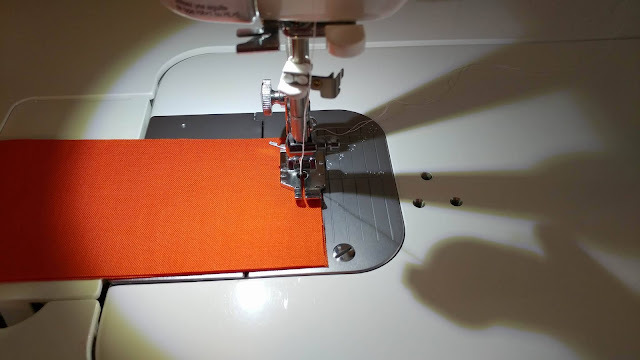 And if one uses SteamASeam it would be easy to sew down because then the binding won't move during the sewing process! 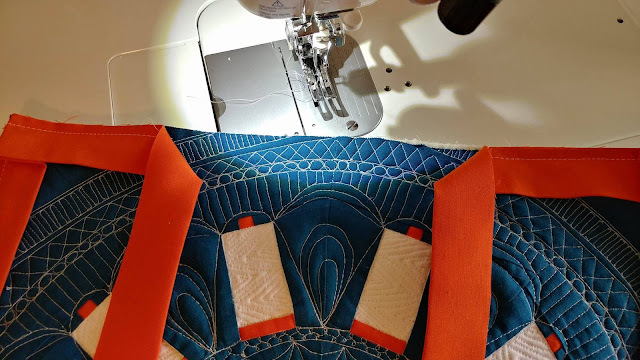 Great tutorial, love Lorraine's idea of using SteamASeam too, I use it for my labels but never thought to use it on the binding. I jus completed my first quilt using your binding method. All I can say is where were you YEARS ago? I hated doing binding because it was such a fight to catch the binding on the opposite side. This is a utilitarian quilt that will be going in my vintage trailer, so I wasn't worried about perfection. This is truly the best tutorial I have ever seen. Thank you so much! I did my first time ever machine binding on a baby quilt. I attached the binding to the back and did a zig zag stitch on the front. It's a baby quilt and since it will need frequent washing, it will be more secure than my normal handstitched binding. It certainly speeds up the process! A little white glue with the final press holds everything together quite well for that finished look AND catching all the edges! Amazing, all the hours I have spent doing this by hand, done at least 60 odd quilts for Age Concern and now can do the binding by machine, thank you so much! Thank you for the wonderful tutorial. The pictures are excellent too. I will now try it, since I've had problems in the past with my binding. Thank you!! 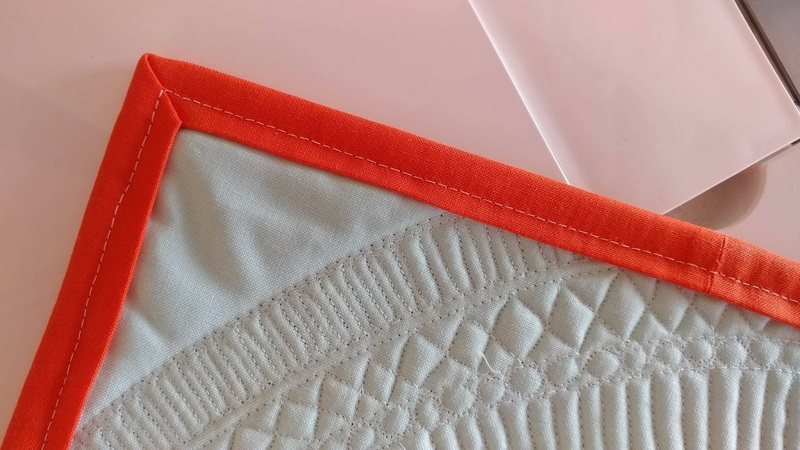 First time I have ever put a binding on a quilt (have always done rag quilts before) and your tutorial was so easy to follow and the pictures were perfect!! Can't hand quilt any longer due to arthritic hands. 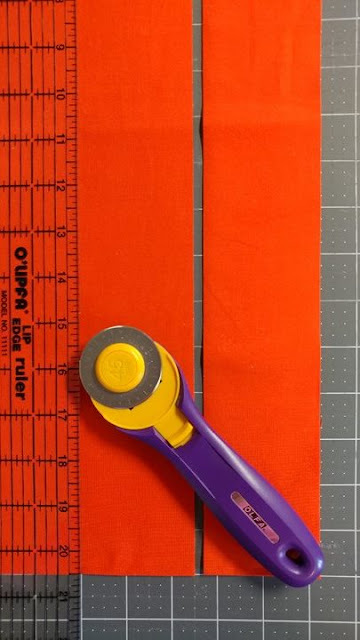 Found this tutorial just in time to finish my grandson's wedding quilt. Thank you for such detailed instruction.